The problems that threaten us cannot be fixed. Please pause for a moment and let that sink in. This isn’t defeatism. I’m not being a capitulationist. This is just the hard facts. No one and nobody is going to save America from collapsing. No one is going to keep the banks afloat. No one is going to reform our government. No one is going to save Europe from her foolishness. No one is going to stop the rise of tyrannical government. Not you. Not me. Not anyone. Now, it is theoretically possible to fix all of our problems by convincing greedy men and women to give up their wealth, power and prestige. It is possible, in theory. But, in practice… not so much. So, please dispense with any fanciful ideas that you might have about how we are going to fix America’s problems. They are unfixable. That graphic comes from Martin Armstrong. He has calculated that October 1st, 2015 – i.e., 2015.75 – will be the date when our financial system begins its final, complete and utter collapse. Since Martin has always been right about these things, we must accept this as a ‘given’. Unfortunately for us, this collapse may have already begun, in Austria. One Austrian bank has already failed. A second Austrian bank is about to fail. The Austrian province of Carinthia guaranteed the bonds of those banks, so it is also about to fail. Oh, and there’s a German bank that is about to fail, because of all that. Furthermore, lots and lots of Europeans took out mortgages denominated in Swiss Francs, and now their mortgages are lots more expensive – and ready for default – since the Swiss Franc is no longer pegged to the Euro. And, we haven’t even gotten to Greece, yet. Since, I’ve mentioned Russia, let’s talk about Russia. Guys, this is REALLY not good. And, before you demonize Vladimir Putin, remember that Russia played a fairly passive role in world affairs until America overthrew the government of the Ukraine. Only then did we start seeing Russian nuclear bombers patrolling international airspace – along with Russian submarine patrols of our territorial waters. But, there’s far worse than that. Far worse. Never in American history have we seen the US military engage in the kinds of exercises that we are seeing now. Never. Never have we seen such a militarization of civilian police. Never. And now, we have Jade Helm 15, the largest military exercise to-date. That last one might be the most important because the analysis is from someone who is familiar with army training operations. His views have the weight of experience behind them. But, let me add my own input. What are they training to do? Suppress and kill American citizens. They are NOT training to repel enemy invaders or foreign insurgents. They are training to capture and kill American citizens. Why would they be training to capture and kill American citizens? Because they expect society to collapse and the government to declare martial law. They are not doing this just for kicks. They are doing it because SOMETHING IS GOING TO HAPPEN – something that will destroy a fundamental part of American society. As a result of that ‘something’ they will need to suppress areas where there is unrest, to stop the unrest – and to destroy any threat to the well-being of society. What would cause society to collapse? A complete financial meltdown. Yes, there are a number of other reasons why society might fall apart, such as an epidemic, war, terrorism or a really big asteroid. But, none of those would require the type of training exercises that we are seeing right now. And yes, a complete financial meltdown WOULD require a declaration of martial law. Well, let’s think it through. First of all, I mentioned a sovereign debt crisis. It’s as sure as tomorrow’s sunrise, so we’ll go with that. 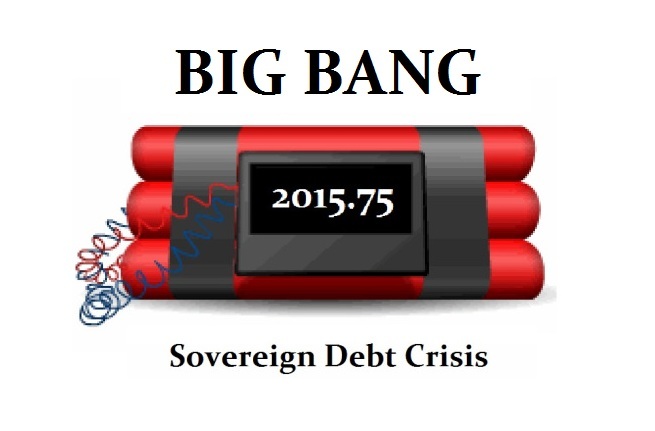 This sovereign debt crisis will cause governments to default on their debt obligations. Those debt obligations are mostly government bonds. Government bonds are mostly held by banks, retirement funds and other governments – in addition to you and me. Banks will be wiped out by this – which means that all bank deposits will be wiped out. This includes company bank accounts. The result will be that no one gets paid. Since people don’t work for free – and don’t give away stuff for free – commerce collapses. Farmers don’t sell to bakeries. Bakeries don’t sell to stores. Stores don’t sell to you and me. This means that people go hungry. Hungry people will look for food and get upset when they do not find it. They will attack anyone they believe to be at fault, as well as those who have food. This means that the cities will collapse. To keep this collapse from spreading, local governments will declare a state of emergency and call out the local military. They will quickly get overwhelmed, which means that the national military will be called out to suppress uprisings. The government will start working overtime to create a replacement for the old financial system. Smart governments will already have backup plans for such a situation. You will not like these backup plans. This will undoubtedly mean an electronic currency. Martin Armstrong has been talking about this for a long time, and I believe that he’s right. I just don’t think that he really understands how bad this will be. Up to this point in time, some of you will have avoided the painful task of preparation because you saw no evidence that a collapse was coming. Everything seemed mostly normal and mostly okay. Well, now you have evidence that the worst is about to happen. Again, the US military is not engaging in these exercises for kicks. They know what is coming, and they are preparing for it. The globalists have been planning for this as well, and will use this opportunity to take everything that you have. The only person who isn’t planning and preparing… is you. And YOU are the target. …but it is ALMOST too late. Well the way i see this is that the bases that have been built to train on should be demolished and the monies returned to the tax payers, not gonna happen. Secondly these men (soldiers) Have been put into the position of enemy combatants. The twenty nine palms survey relating to Will you fire on American citizens? Yes you stay in country, No you are shipped out! There is absolutely no reason this or any other Military training in and around our streets should ever be considered. As former a former Peace Officer and not Law Enforcement, too which there is a major difference, I see this as hostile and unacceptable, that the thought is even activated. This should send a dire warning to everyone what is about to take place in this country. Great article if that’s appropriate. We must bear in mind that the local “gubmint” officials gave these criminals permission to conduct this treasonous activity. That would be mayors, sheriffs, county commissioners, etc. They all wrote off on it. So, those individuals are criminals as well and should be immediately yanked from their positions by their employers. At gun-point if necessary. How about if the true Americans attempted to shoot down those helicopters? If citizens identify any of these criminals – in or out of uniform – they could conduct citizens arrests by surrounding the Nazis and taking them to the local jail. Go after the officers – cut the head off of the snake. @Old Henry: Sir I am in agreement, its getting the necessary backbone in gear, God bless you Sir and stay safe & ready! God is screaming the answer out loud and clear …. SECESSION !!! All we have to do is listen. Re -boot the south. The Bible Belt. Read the dream at Z3news.com about how the south saves America. Let’s be still and listen … God speaks to the humble quiet listener. He LOVES what John Little is doing, but all us Christians are a TEAM. You ( John ) might be one of the coaches but each team member hears God too. This is very important. Think this through …. liar by your delusional thinking. The wicked SHALL be turned into hell, and all the nations that forget God.Psalm 9:17 PERIOD ! It’s so simple that anyone not brainwashed by the evil American education system can understand it. It does bewilder me when speaking to people who are somewhat aware of current events still holding to the view that the end game is something our grandchildren will have to face. But not us. They are in for a rude awakening. I find it very curious that part of the training of Jade Helm involves special ops blending in with the community. How will they be doing that when the training will occur in the middle of the night? And regardless of how much they train, how can they blend in with people in the middle east for example, where much of their misadventure is currently taking place? This is clearly training to deal with us. The good news is this: If Martin Armstrong is correct, all of us still have a few months to make some preparations. The bad news is that the military will by then be practiced, warmed up and in place! And I expect ‘extractions’ of undesirables will begin before fall. There are so many big and very bad events occurring now that something has to break. the economy is one. But even the planet is being destroyed. Fukushima has gone on for more than four years and now they tell us there is no way to fix it or stop it. What is coming will not wait for our grandchildren. It’s coming for us. I believe the Asian Infrastructure Investment Bank (AIIB) which is a China-led investment bank and already has over 40 nations (including Israel) indicating their willingness to become founding members will add pressure and quicken the demise of the US economy. You could not have stated this any more accurately! We have a few more months, by God’s grace, but people do not want to hear it. This is troublesome and very sad. Hi John, the US is end times Babylon (Revelations 18). The US has had 70 years of world dominating rule, same as the first Babylon, that time is now up, watch for the Feast of Trumpets (Sept/Oct this year). The US admin is adamant anti Israel so the God of the Bible is anti US. The “O” in the Office is modern Haman. His time has been judged. What if a asteroid, the size of Texas was to hit the US. NASA knows everything about it but telling the citizens would cause panic. Maybe that is why they have to have a “police state. Do your research. Hi there, What does Helm 15 stand for? thanks. Long time reader, first time commenter. As a former United States Marine who dealt with communications, Top Secret coms, and was Marine Force Reconnaissance this is appalling and SHOULD be a wake up call to all the american people. Even if your an atheist you should realize that when your government OPENLY runs training ops like this that you are in trouble. But as you said Our Ship has Sailed. The only thing to save us now is Our Lord and Savior JESUS CHRIST, the King of Kings and the Lord of Lords. People, please get ready, get food, water, weapons for self defense-not murder, but above ALL; REPENT OF ALL YOUR SINS and TAKE REFUGE IN THE CLEFT ROCK WHO IS THE MASTER AND LORD AND KING OF ALL!!! THE ONLY WAY TO SURVIVE NOW (NOT NECESSARILY THIS LIFE BUT THE NEXT ONE WHICH IS ETETNAL) IS TO TRULY REPENT AND ACCEPT AND WORSHIP AND FOLLOW THE LAMB WHO DIED FOR EVERYONE OF US THOHGH WE DESRVED HIM NOT. PEACE BE TO ALL OF YOU AND MAY GOD BLESS YOU ALL!!! Very hard times are coming to America very VERY SOON! I also wanted to say, brother John Little, keep fighting the good fight and being one of those “derranged” voices in the wilderness. I don’t agree with you on everything, maybe 95% I do. But that’s the beauty of our Lord. In this life we won’t have it all figured out, we can’t, we aren’t even close to His level of understanding. His thoughts truly are higher than ours and His ways are higher than our ways. As long as you do your best truly by studying and trying to discern His Word to us, but also putting it into action and living in Him and through Him, repenting and accepting Him as your Lord, he will Save You. But do not do it in haste but truly for as He said some He will say I never knew you, leave Me you workers of iniquity! You can lie to everyone, you can even lie to yourself, but not to Him. He knows our hearts better than we do. Be honest and true for He is Love but He is also fearful and righteous. The fear of the Lord IS the beginning of wisdom. Again brother John, may His words be a lamp unto your feet and keep you on the hard and narrow path through the narrow wicket gate. Blessings to You and Yours and ALL OF GODS CHILDREN. Operation Jade Helm is just the LATEST evil cooked up by our government and leaders to come down the pipeline. Operations like this have been going on for some time in secret, but the open blatantness of this operation should shake every sane person to their core. We are so near to the end of this country that they don’t even care to hide it anymore. And as long as people keep on their blinders with TV, social media, and the Kahrdasian types, the less the government cares anyway. If even 5% of the people scream and fight it does not matter if the other 95% remain in their sinful ignorant bliss. They are also the ones that think our government would never kill innocent people or harm them for the greater good. This has always been their concept, and whatever benefits the Elite and theirs is for the greater good. Again, JH is just their latest evil. Look up Operation North Woods, Mongoose, Agenda 21. For the majority of society they would never care to or try to find things about their leaders unless it was a painless link clink away from a Facebook posting. We as a people have become sinfully complacent and lazy. As one who has worked for them and their greater good mentality, trust me, and people like John, they will do things to you and your loved ones that are beyond belief and comprehension. Please waste no more time. Ready yourselves but most importantly get right with GOD. They may have the upper hand for now, but when HE returns it will not be as before like a slain lamb, but The Mighty and Unbeatable KING!!! Praise and exaltation be to HIM forever and ever. HE has beaten and conquered Death itself and We are HIS children. PRAISE JESUS CHRIST OUR KING!!! One interesting element to the coming martial law is that the average American will beg for it when things fall apart. The elites steal from our society, undermining its foundations until the society tips over. Once society crumbles, they limit the options for fixing ‘The Problem’ – so that you are forced to choose what they want you to choose. Rinse and repeat until humanity is destroyed. We have the illusion of choice, but it is pure fantasy. I thank God that He will defeat Satan utterly. I just regret the cost. God bless you, BisonMarine. It is a pleasure to see your comments. I read one opinion on this and they thought it was a veiled reference to China getting into the action – Jade (as in the semiprecious stone) referring to China, and Helm referring to a point from which control is exercised. I guess we’ll find out sooner or later. Instead of preaching pessimism a little inspiration and a call to prayer is what this country needs. There are plenty that preach hopelessness. It is serious not hopeless. You give up to easily. I’m surprised you didn’t let God have his say. Notice this addressed to “MY People”, not the unbelievers. Please read my previous articles. You will find my call to repentance throughout. What you fail to understand is that the problem originates with those who claim to be Christian – those who are called by His name. If I saw a revival of repentance among our brothers and sisters, I would have some basis for hope. But, there are no signs of repentance in the American Body of Christ. This website exists to speak truth to the lies that bind, to free the children of God from the errors that blind. I am but one voice among many, and there is no time for pretty words and worthless dreams. Darkness comes. Are you ready KB? If you care to re-read what I wrote, you will have to agree I do understand who that scripture was directed at, MY PEOPLE. At the same time I am not deluding myself into thinking all is fine; I know better than that, but as a Christian, I know what the word says. Faith is tantamount to pleasing God. Mat_17:20 He told them, “Because of your lack of faith. I tell you with certainty, if you have faith like a grain of mustard seed, you can say to this mountain, ‘Move from here to there,’ and it will move, and nothing will be impossible for you. Heb_11:6 Now without faith it is impossible to please God, for whoever comes to him must believe that he exists and that he rewards those who diligently search for him. For many years, I have done my best to get people to wake up to reality and prepare for what is coming. It is roughly like trying to fight a rising tide with a pitch fork. The vast majority of folks are locked into their delusions due to the constraints of their particular brand of normalcy bias. They insist on operating via wishful thinking. I noticed that you mentioned Russia testing a new type of ICBM. I believe I mentioned this before. Years ago, however, the Son told me that scientists in Russia and China were feverishly working on ways to use America’s technological advantages against her. He then added that they would succeed spectacularly. Afterward, he told me some secrets about how the Great War would unfold. TO put it bluntly, Russia and China are going to humiliate America’s armed forces. Within a few months, they would destroy the American Navy and wipe out America’s aerial forces. By then, America’s military will have already suffered more than 400,000 casualties. America’s war efforts go downhill rapidly from there…Two incidents, during the past couple of years, exemplify how things will go for America’s armed forces in the Great War. They also reveal just how advanced Russia’s military might has already become–and will only improve throughout the next few years. The first incident occurred when an American warship Fired couple of missiles at Syria, around the time America falsely accused Assad of employing chemical weapons. Nonetheless, Russia shot down the missiles over the Mediterranean Sea before they managed to hurtle very close to their targets. More recently–just after the nonsense began simmering over the Ukraine mess–President Obama assigned a big bad warship to parade around the Black Sea to show Russia that America is not going to put up with her nefarity. Ha! Warships of nations not bordering the Black Sea are only allowed to stay in such for 21 days. Of course, the American warship broke the rules and overstayed her welcome. At first, Russia remained patient and even said please. America refused to withdraw the warship. And so, Russia sent a couple of fighter-bombers on a mock attack. As the they approached the warship, their pilots flipped some switches. Suddenly, the crew of the warship discovered that their ship was blind and deaf–and defenseless. The fighter-bombers mocked them by making three attack passes before withdrawing. The exercise shook up the warship’s crewmembers. Their warship skedaddled to a port in Romania. As soon as she docked, a significant portion of her crewmembers demanded they be allowed to resign from the Navy immediately…Some senators once asked an admiral how long would America’s aircraft carriers endure during a war with Russia. He said that, unless they were docked in a safe harbor, all of them would be resting on the bottom of the ocean within two weeks. Russia has submarines that our Navy refers to as black holes. They can sneak up to and away from any of America’s warships without being detected and are armed with missiles and torpedoes that can demolish any ship in the American Navy as if such were shrimp trawlers. How long do you think it will take for Russia to miniaturize her ingenious sensor-scanner killers and outfit her missiles with such? Well, anyway, America also has huge problems dealing with China’s armed forces, especially now that Russia and China have become allies and are sharing military knowhow. China already has enough submarines to sink all of the American Navy’s warships in the Pacific. Add to them North Korea’s submarines. Iran is also developing submarine forces. Recently, she began deploying a radar system that can detect stealth aircraft. If Iran can do it, then it is a sure bet that Russia and China can also detect and track–and shoot down–stealth aircraft. Lastly, according to a report by the US Air Force made in 2002, the aerial forces and antiaircraft capabilities of Russia and China had already achieved rough equality with America’s aerial forces forces–and clear superiority in some aspects of aerial combat. I guarantee you that the aerial forces and antiaircraft capabilities of Russia and China have improve greatly since then whereas America’s aerial forces have not improved significantly. Sure, America spends far more on her armed forces than Russia and China spend on theirs. The problem is that America wastes huge amounts of her military budget. Likewise, huge amounts of the funds in question evaporate through fraud and theft. Then there are the debacles. such as the F-35–a waste of hundreds of billions of dollars in R-and-D that essentially created a flying disaster…. I think Armstrong does see how serious it is – he said in a recent posting that if his solution is not implemented, don’t worry about reading his blog – he will get the h*ll out and watch for the mushroom cloud. The reason he is so successful is that he DOES understand how things really work, at least in the material world. He has warned several times of things going toward extreme authoritarianism. And you’re exactly right, the greedy people who did this to the world are not going to suddenly become altruistic and give up ANYTHING. So I think the worst case scenario is exactly what we’re headed for. I wondered what you thought of Jade Helm. I’m glad you addressed it. It just seems so very, very strange. I have tried to warn / wake up several people but none of them get it at all. They think it’s just crazy conspiracy stuff. I did see the recent post. And, the thought DOES occur to me that he hasn’t revealed his worst fears until now, because he is trying to be positive. Having said that, I still detect an inability to comprehend true evil. I suffered from a bit of that blindness for a while, so I understand it. There is something inside of us that just doesn’t want to believe that true evil is so diabolical – and so real. I also sense from his word usage that he has some working knowledge of Christianity, but I do not have a sense that he is actually a Christian. Any inability to perceive the spiritual dimension of our problem will ultimately prove fatal. Excellent work, DRG. It’s good to see critical thinking. No one should EVER take ANYTHING that ANYONE says (other than God) at face value. Amen John! Like you said, our society is so undermined and invisibly whipped into obedience that when horrible hard times come the people will quickly choose the plan that the elitists wanted all along. I’ve seen it firsthand in other countries that we meddle with and now for the worst time coming to our own land. They will seem to come in just in time and save the day, just trust us. Wink wink. Freedom and liberty are ficticious and unobtainable illusions in this world. And sadly most people subconsciously long for subbgegation instead of doing and leading for themeselves. The elites know this, its been our peoples way since the beginning, Egypt and the slaves, always waiting for someone to lead them. The leader is always allowed by God. It may be a great one like Abraham or Moses. Or it may be a horrible one like Nebuchadnezzer, Hitler, Obama. We receive the leaders that we deserve. Gods plan is always perfect and always in control. Please, I beg You, just make sure that you are in league with CHRIST and not with Satan. Don’t take my or anyone’s word for it. Always test the Word and the Spirit to know for yourself. MANY MANY will come in HIS name and prophecy and do wonders but there is ONLY ONE! ONLY HE IS TRUE AND JUST!!! Test the water and when it is found clean and Holy, consume and drink!!! Time is very VERY SHORT!!! Prepare yourselves and your loved ones. The harvest is coming. DO NOT let yourselves be the chaff that is blown away and consumed by the fire!!! IT IS NIGH!!! PEACE, LOVE, MERCY AMD GRACE BE TO YOU ALL!!! AMEN!!! Sorry folks. I feel as if I am kicking the proverbial dead horse. As I said before, when I was young, dumb and invincible I served in the Marine Corps and was part of Force Reconnaissance which is pretty much their version of the SEALS and the precursor to the Marine SpecOps we have today. As someone who has taken part and trained in many of the Jade Helm type operations in the past it makes my skin crawl and my guts twist now. When I was still an atheist I got sick and disgusted with the part of our government and leaders that most people don’t see on a day to day basis. I walked away and made my family priority number one. Until a few years ago when GOD graciously and lovingly woke me up and made me a NEW Creature. When our militaries do ops like these for this duration and scope, they are meant to be implemented for about 2 to 6 months down the road. That puts us well in the October 2015 time frame. When the economy drops out and chaos insues, Big Brother will come in and “save us”. Martial Law will be adopted for our own “safety” and most will be thankful to them. A lot will hope Please God just don’t let my Facebook and Candy Crush go down. SAD. Sad, horrible, disgusting, soul crushing, mind numbing times are iminately close. Not even mentioning WW3, Ezekiel’s fire, and all the rest of the seals, plauges and viles. I personally CAN NOT WAIT FOR CHRISTS RETURN!!! Brothers and sisters, pray to HIM. Pray for strength, wisdom, discernment, and above all FAITH!!! Faith in HIM and HIS perfect and finished work!!! We all know that the war has already been fought and won, and HE is VICTORIOUS!!! We must pray not to lose our faith. Not to waver in our last seconds of life in the coming pain and evil. DO NOT WAVER OR SWAY BUT PLACE YOUR LIFE AND YOUR FAITH ON THE SOLID ROCK!!! THE ROCK THAT IS CHRIST JESUS!!! AMEN!!! Rev. Says a 3rd WW will arise out of the Euphrates River Valley that will kill 1 / 3rd of mankind on the earth. That will include US soil. The Righteous Judge is here. I take great comfort in I AM the Architect of the Last Days. He looked all throughout time in history and picked NOW for us to be born living at our exact address for His plans and purposes. ALPHA OMEGA DELTA FORCE END TIME WARRIOR BRIDAL COMPANY REPORTING FOR DUTY! There’s nothing coming our way He hasn’t fully equipped us with armour and weapons to handle. Others will see and exclaim What a mighty God you serve! A word of practical advice for others like myself who cannot afford to build a fortified underground bunker or disappear to a remote location, who will have to do the best they can to shelter in place. Think of the everyday, inexpensive (today) things that we take for granted, that life would be so miserable without. And think of the mindset of the people who may be going through your things and taking whatever is of value, and how you can use this to your advantage. Example: once the economic and supply systems are kaput, we will be lucky to get anything to eat at all, and it will not be balanced. Americans are several generations from having to worry about scurvy, pellagra, beri beri and goiter; so many supplements are added to commercial food that we don’t even have to think about it, like iodized salt and vitamin D in milk. You can go blind if deficient in vitamin A for a long enough time, and lose all your teeth from scurvy, and get permanent brain damage from a thiamine deficiency. Some of the pioneers had to make it through the winter on the plains with nothing but a couple sacks of cornmeal, and by spring many showed signs of scurvy and goiter. We are about to become a third world country. Most of us are overweight, but using up that fat is not going to prevent deficiency diseases. The preppers emphasize getting in shape, etc, but I rarely see any of those articles explore the issue of a trained athlete who is blind, toothless, and suffering from dementia. Not to mention, we should all be buying the proper iodine supplements to block the radioactive kind that surely is increasing, via Fukushima, that our media is silent about. There are all kinds of other damaging radiation particles out there, to be sure, but this is at least one thing we can do. Research carefully, there are a lot of scams and rackets catering to the prepper community. Today, you can go to Walmart and buy years worth of multivitamins for under $50. Do it. Minerals too. Educate yourself about real nutrition, not the multibillion $ health racket industry. I see this kind of nonsense advertised everywhere, even on Quayle’s site. Then, put your pills in a different bottle, label it “Earthworm Castings” and put it in the garden shed. Put a bunch of them in sealed containers and bury them in a 50-lb bucket of (unused) cat litter with a scoop and put it in your garage, as if its only purpose is to scatter on your driveway in the winter. A starving desperate person is not going to grab a 50 lb bucket of cat litter and run off with it. Think. We have time to think now, and soon we will not. I am going to bite the bullet and get ALL my dental work caught up. The only thing worse than going to the dentist now, is not being able to later. I can’t do EVERYTHING I would like to in order to prepare, but I can think hard about all the small things I CAN do, which could save me an awful lot of grief later, should I survive the first volley. The question is which list is you or your family on. It will determine how you are rounded up (or if they will just murder you outright). The dominoes are lined up just waiting for the event to topple them… most likely starting in June. If people riot over sporting outcomes that ultimately mean nothing how will they react when something really does matter? The only list that will matter in the end isn’t even kept here on Earth!! I agree with your analysis, but have wondered about your reference to 2 Chronic 7:14 in your previous post. Don’t you think there is a moment in time where God’s judgment is set and all we can do is pray for those around us and for ourselves? Our nation has unfortunately already cursed Israel. I so appreciate God’s mercy and your obedience with respect to noting the few months that may be left. For me, the shock value of these things has diminished over time. It has become a part of my consciousness, but the October date will help to translate that awareness into some final actions. I also believe that our nation has gone too far to be recovered. But, it is never too late for repentance, and I see that you know that. I pray that your final actions will be enough. God bless you, sister. I am praying that the Lord will use these world events to cause those who name Christ, yet deny Him in the deeds of allowing idolatry to exist in the “American church”. Matthew 7:21 indicates that a vast number of people will bring claim, but be left in shame on the day of judgement. May it please the Lord to raise up men like Ehud in these last day’s. The sovereign debt crisis (i.e., collapse of government bonds) is coming and cannot be stopped. I don’t even think that it can be slowed. And, it follows a cycle – which is what Martin Armstrong is saying. Having said that, I DO believe that the Elites will ‘unwind their positions’ before this collapse happens. Of course, that action could cause the debt crisis to happen, all by itself. So yes, because it talks about WHAT is going to happen. And no, because I disagree a bit on WHY it will happen. This is getting surreal…even more so than the last time I commented that things were getting surreal. It is very interesting what your experienced military readers have to say about Jade Helm. I knew the ebola hysteria would fizzle because they (the hysteria mongers) had the science all wrong; but I have no such assurance about this. I try to stay in the middle of the road, since disinformation and propaganda are rife on all fronts; but even Armstrong, who seems to be a think-before-speaking kind of guy, is starting to talk about plans to “thin the herd” and having to face military robots. He said something about that today, to the effect that this has been in development for a long time because human soldiers can turn on their masters and they “want to eliminate that wild card”. Think about that for a minute. Think about all the horrible orders that have and continue to be acted on by human soldiers. How bad can the orders be to where they can’t trust human soldiers to carry them out? This is not about protecting our forces from direct harm. Since when have any elites cared about the people they send to war? These are the same people who want to thin the herd, remember. I read something the other day, I forget where, but I think it was about the Viet Nam war and they were under orders to kill at least 400 people a month, for no particular reason. That is the very same thing Stalin did, except the quotas were higher. Herd thinning. Dave Hodges wrote (yesterday, I think) that his military sources are very uncomfortable with Jade Helm because even they are being given very little info about its real purpose. And I think it’s very, very interesting that Jade Helm is going to finish up just as we are approaching Armstrong’s 2015.75. I don’t even talk to my normalcy-bias friends about this because they already think I’m off the deep end on much tamer topics. I keep thinking about what you wrote when coming back from Jerusalem, that the Israelis were very aware of the daily dangers they face, but Americans are blissfully unaware that the peace and security we are accustomed to, and think will last forever, is actually paper-thin. And could (will) be shredded in a moment. I think of the wording used in the Bible …. those who dwell carelessly in the isles; she who thinks, I sit as a queen – I shall never know widowhood or loss of children. Weep and howl. There will sure be weeping and howling when it comes down. I think of an empire which thought no one could possibly prevail against it, and drank and partied while an army diverted a river and came under the walls. Hello all. I don’t know if anyone else saw or mentioned it here. NASA has been trying to press our government for the last 5 years about the increased possibility of a massive solar flare and or CME taking out our power grid for years. They now say it is at least a 12% chance that it will happen in the next decade. Our government will not and won’t listen and its not covered on main stream media. Geez, I wonder why. Hhmmm.. NASA even released a new short movie titled SUNDAYS showing a post sun flare apocolyptic world in our nation. The video talks down God and puts man and science over him, but that doesn’t take away what would happen if you believed in God or not. Ezikiels fire is coming my friends. PREPARE YOURSELVES. GET SUPPLIES AND STOCK UP WHE YOU CAN. Yes you or I may die within the first few hours of it, … or we may not. IT IS ALWAYS BEST TO PREPARE FOR THE WORST AND HOPE AND PRAY FOR THE BEST!!! MAY GOD BLESS US ALL IN THE FUTURE AND MAY WE BE LIGHTS OF TESTIMONY TO OTHERS AROUND US FOR HIS GLORY. I also have a feeling that’s it’s ‘the last good summer’. Which is fine either way, by grace now having the Lords kingdom and His kingdom is not made by the hands of men.. When backpacking in the wilderness everybody wants to get to that high lake on the mountain top with the wild trout and granite staircase waterfalls from the glacier up above..but some don’t want to climb the scree switchbacks above the tree line in the hot sun and with all that weight on their backs..
A grueling climb at times but worth it for once cresting the edge and seeing the waterfall and the beauty all the long climb is forgotten. And that’s in the natural, but reminds me sometimes of the faith walk. Keep climbing folks, finish the race to the high calling of Christ! With God all things are possible. Let us not forget that there could come a time in the life of a christian when he should die for his faith in Jesus Christ instead of denying him. We should pray without relenting. The bible in the story of the ten virgins showed that the bridegroom comes in the midnight. What else does this night stand for if not time of trouble that could wear out the weak believers ( foolish virgins)? Its good to prepare but much better to get right with God for without peace and holiness, no man will see God. I am afraid I and my family are stuck here in the United States, moving isn’t an option. I am preparing the best I can – food, water, ammo etc. etc. But I have to believe that God will guide and protect us who have to stay in America. It is scary to think of what “we” ( the United States ) has become in just such a short time. May God bless you and keep you safe. I pray that your devotion to the Lord and your physical and mental preparations will be enough. God is good, and He will see us through. Few of us are going to get out of this alive, but our devotion to the Lord will earn us eternal reward. So, read your Bible every day and lay up treasures in heaven. We cannot expect miracles, if we don’t. God bless you James. I pray earnestly for all who are in your situation. I was doing research on silver because I just started stacking, and God mysteriously guided me to your site. It’s comforting to be in the presence of other Christians, even if it’s online..
At any rate, I am former military. I assure you that many veterans are behind the American People. We took our oath seriously. If we have to take up arms against the DOMESTIC enemy in uniform who want to harm the very Citizens we promised to protect, then so be it. The government don’t just come up with fancy operational names for no reason. There is always a meaning behind every word they use. Jade – It’s a GREEN ROCK. The color green is islam’s color (look at flags of muslim countries, most have green). Moreover, muslims pray to a rock when they face east. Helm – A position of leadership or control. Put the two together. Scary. Well, it’s scary on earth., But as Christians, we all know that God is on our side, and He will protect us. Thanks for your site.. I subscribed. God Bless. As someone who speaks Hebrew, I can tell you that this is NOT true. The video is certainly interesting, but has nothing to do with the truth. If it’s Hebrew, it certainly doesn’t mean ‘Hand of God’. Yadei WOULD be ‘Hand of’. But, Helm? That would NOT be Elohim. Not even close. The closest word in Hebrew would be Halom, which means strike or beat. But, that would assume that the people behind all this are Hebrew-speakers, and THAT is ridiculous.